Cubs fans waited more than 100 years, but in 2016 their team claimed the title of World Series Champions. 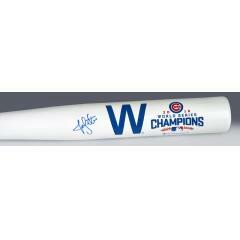 To commemorate an amazing and historic season Jon Lester signed a limited number of authentic World Series Champion "W" Bats for fans. These bats feature the iconic Blue W, the words "2016 World Series Champions," and all of the highlights of the 2016 season, including final Regular Season record, All-Stars, batting leaders, pitching leaders, and MVP award winners. NLCS C-MVP Jon Lester signed each bat, which is fully authenticated by MLB Authentics. A fierce competitor, Lester proved to be a most reliable member of the starting rotation. He and his regular battery mate, David Ross, kept hitters and runners at bay throughout the regular season and the playoffs. He finished the season with 19 wins and a 2.44 ERA.These bats will not last long, so get yours before they sell out! We have these IN STOCK and READY TO SHIP!